This is it folks, the last new Falcon in dealer stock. It was found in the corner of a warehouse after a Ford dealership was sold last month. Picture: Westpoint Ford. A BARN find usually refers to a classic car covered in dust after being forgotten for decades in an old shed. But the last Falcon to be sold as new is effectively a modern barn find given it was only discovered after a Ford dealership was sold. 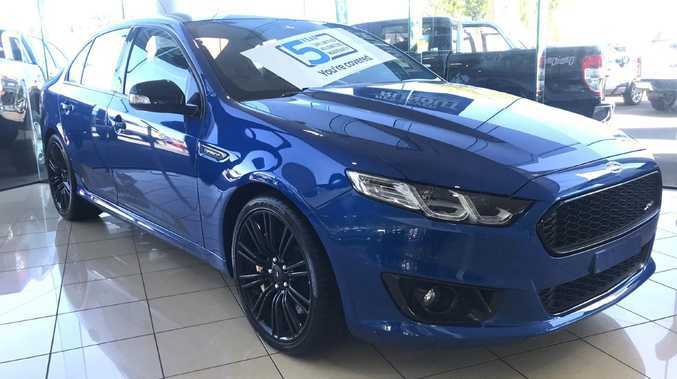 The previous owner of Westpoint Ford in Hoppers Crossing, in Melbourne's western suburbs, planned to hang onto the metallic blue Falcon XR8 Sprint as a keepsake and stored it in a warehouse. When the business changed hands last month the new owners did a stocktake and found the final Falcon among the 200 or so other cars in the inventory. "For us it was like a barn find because we didn't expect to find a Falcon still in stock," says general manager Alexi Sakellaris. "The previous owner was going to hang onto it but when he sold the business he said the Falcon would come with it, so there were no loose ends." Last Ford Falcon in dealer stock — for sale two years after the factory shutdown. Picture: Westpoint Ford. 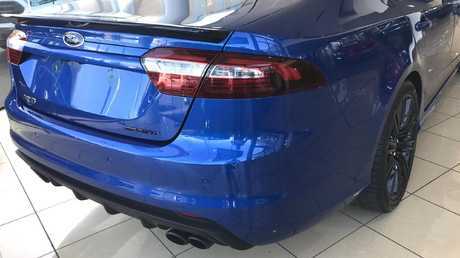 While some dealers were charging a premium for the final run of fast Falcons - 850 XR8 Sprints and 550 XR6 Turbo Sprints including 100 and 50, respectively, for New Zealand - the dealer says he won't charge "silly" money. 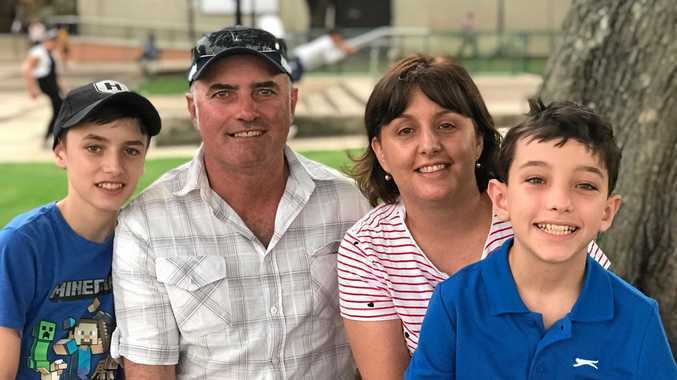 "We will sell it close to the RRP, we're not going to be too silly with it," says Sakellaris, estimating a drive-away price between $65,000 and $70,000. Ford Australia spokesman Martin Gunsberg said the vehicle is the "last brand-new, unregistered Falcon in dealer stock according to our records". 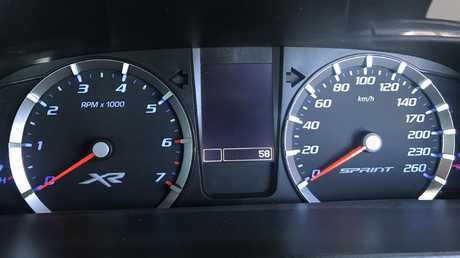 The car is a metallic blue Falcon XR8 Sprint with six-speed automatic transmission, powered by a supercharged V8. It has never been registered or driven, has just 58km on the odometer, and is number 739 of 750 for Australia, according to a plaque on top of the engine. The car was built on 7 September 2016, exactly one month to the day before the Ford factory shutdown - and still for sale two years later. 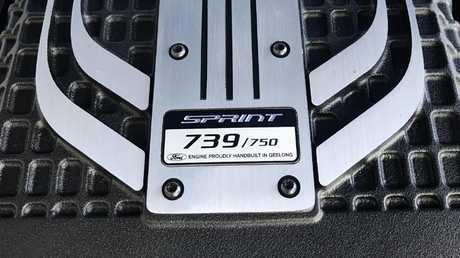 The blue XR8 Sprint is number 739 of 750 built for Australia. Picture: Westpoint Ford. Another quirk of the vehicle: it will come with a five-year factory warranty. When the final batch of Falcons was released the company was only offering three-year coverage. It has since increased the warranty on all new vehicles to five years. 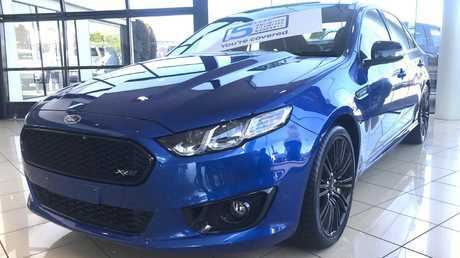 Official figures show just five Falcons have been reported as sold this year nationally; the Westpoint Ford example remains the last in dealer new-car stock. Someone must have taken a test drive. The last Ford Falcon has 58km on the odometer. Picture: Westpoint Ford. Ford kept the last Falcon sedan, Falcon ute and Territory SUV to roll off the production line on 7 October, 2016. In October 2014, two years before the shutdown, the last Falcon GT - number 500 of 500 - sold at auction for $236,100, three times its RRP. All the funds were donated to charity. Meanwhile, Holden dealers are selling down inventory of locally-made Commodore V8s and Holden Special Vehicles models. Almost a year to the day after local production ended at the Elizabeth factory on the outskirts of Adelaide, Holden says approximately 100 Australian-made Commodores remain unsold at dealerships nationally. However, a number of those are being kept by dealers as collector pieces and may never be marked as sold, so it will be difficult to ascertain the last customer-delivered Aussie Commodore. Footnote: The last brand-new Ford Falcon in dealer stock sold a few hours after this article was published.